Where will the Kenya passport lead you? 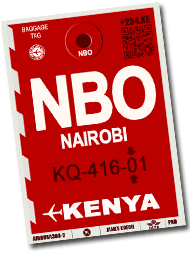 Kenya Airways is one of the most dynamic airlines on the African continent. It allows us to fly to many destinations on several continents. But the difficulties and conditions of obtaining a visa as well as the often long delays before having the reply of the embassies discourage many candidates for the journey. We have reviewed the destinations to which travelers of Kenyan nationality can travel with a simple passport and without prior visa. Kenyans can nowadays travel freely in 65 countries of four continents. In the ranking of freedom of movement, this ranks Kenya at 68th place. From dream destinations in remote islands, to large nations with strong economic growth and of course through our close African neighbors, the Kenyan traveler is spoiled for choice if he decides to travel for tourism reasons, for health reasons, for studying abroad, for shopping or doing business. These 65 countries to which you can decide, without any form of prior formality, to fly for a stay generally limited to 90 days sometimes speak English, French, Portuguese, Arabic, Spanish, Chinese or even Kiswahili. Others have one or more exotic official languages: Bengali, Khmer, Lao, Malagasy, Timorese, Farsi or Samoan! For your shopping, Hong Kong is a bit far. It is therefore Casablanca that we recommend you. Its giant markets, supermarkets and shopping areas allow you to have access to all the products at the best price. Tunisia has a place and a reputation in the world of medical tourism. State-of-the-art clinics provide access to the most modern treatments at reasonable prices and cosmetic surgery. Those who wish to stay in the English-speaking world will be able to choose Ghana known for its dynamic schools and universities as well as for its quality of life and pleasant climate. Others may try the language experience of studying Spanish in Panama or French in Senegal. If the beaches of Samoa and Micronesia are splendid, they are inaccessible to the common of the mortals so far away. Among the world's top tourist places accessible to Kenyans without a visa and in which it is possible to fly by direct flight or with a single connexion there are of course Bali in Indonesia, Mauritius or St. Vincent and Grenadine in the Caribbean. Here is the map (click to enlarge) where citizens holding a Kenyan passport can travel freely, without any prior formalities. In green, countries that do not require a visa, in violet the countries where the visa is granted automatically when you arrive on the spot. The length of stay without visa or with a visa upon arrival depends on each country of destination: it can vary from 21 days (eg Dominic) to one year (eg Ethiopia). (1) Somalia: visa on arrival for 30 days, provided an invitation letter issued by the sponsor has been submitted to the Airport Immigration Department at least 2 days before arrival.